Sweden is not renown for its climbing but as a matter of fact the Mecka of Europe’s single pitch crack climbing is located in Bohuslän, on the west coast of Sweden. It has not only the most beautiful crack climbing but it is also known as Sweden’s pearl, with its marvellous crags and deep fjords: this is one of Sweden’s must see destinations. Romsdal, Norway – also called The Scandinavian Chamonix, is more know for its alpine climbing with long routes. Climbing here gives you the possibility to become Fjellkonge or Fjelldronninge which means king or queen of the mountains. 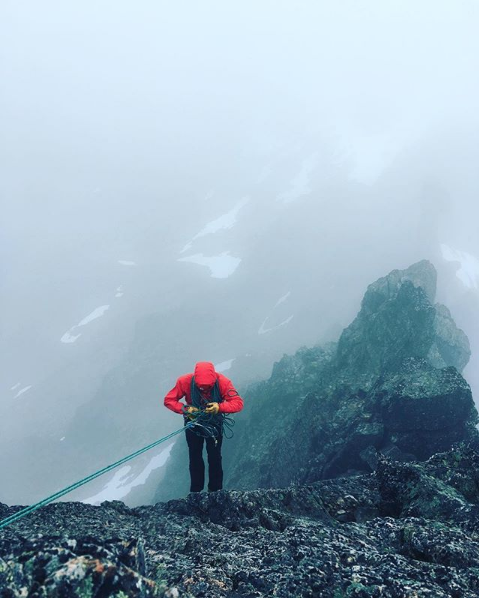 To do that you’ll have to climb up 7 summits located in the area that provide some fine alpine climbing in fair weather conditions. Otherwise this area is Norway’s best trad climbing destination and the routes are endless. This will depend on the location you will chose, therefore I will send you further information in the confirmation e-mail. Romsdal: there are plenty of hotels or camping sites where your stay will be pleasant. Bohuslän: I recommend the Bohuslän Climbing Cottage to be our home to fully experience the climbing culture of this area. You can either stay in a tent or in the cottage itself. There are also a number of hotels with sea view nearby. I will provide all equipment, but you’ll need your own climbing shoes and harnesses. Please note that you will need your own insurance to be able to climb in Norway and Sweden. Groups can be up to 3 persons, if you are booking alone but want to climb in group this can be arranged. Contact me for more information in the contact link further down below and I will see to arrange your stay after your demands and expectations.